We invite pupils and students to join us for the 2017 ESU Ukraine Shakespeare Competition! The 2017 English-Speaking Union Ukraine Shakespeare Competition will take place on 1-20 April 2017 at Kirovograd State Pedagogical University. 1. Make a video presentation of one sonnet and save it on Youtube. Take the sonnet only on the site. 2. Download an application form from the ESU web-site (http://www.esu-ua.org.ua Heading “Our Projects”, Shakespeare Competition). Fill in the form, indicating the reference to the video presentation on Youtube. The Deadline for application forms and video presentations is 1 April, 2017. The results of Round 1 will be announced on 10, April 2017 on the ESU site http://www.esu-ua.org.ua and semi-finalists will be invited to take part in the final of the competition. 1. Semi-finalists learn and recite a different sonnet by W. Shakespeare in the final stage of the competition. It will be held on 20 April 2017. · Music accompaniment is not allowed. · Get engaged in an interactive, performance-based study of the English literature. · Participate in the close reading of Shakespeare's text through intellectual, physical and vocal engagement. · Develop critical thinking and close reading skills. · Increase their self-confidence with public-speaking. · Discover and explore the beauty of complexity of Shakespeare's poetic language and classic themes. · Bring the timeless works of Shakespeare to life and learn to express his words with understanding, feeling and clarity. Congratulations to the winners of the NPSC 2017! If another person has translated your poem(s) for you, you must acknowledge this and confirm that you own the copyright in the translation. Poems may be (a) on ANY subject or theme chosen by yourself, OR (b) on the subject or theme, "Happiness", interpreted in any way you choose. You may use any form, style or genre. 1st prize; USD100.00; 2nd prize: USD45.00; 3rd prizes (up to four winners): USD20.00. If there are enough good entries, an anthology of prize-winners and selected other entries will be published. Those whose work is included may purchase the anthology at a discount (but are not obliged to do so). Max number of entries per person: No maximum. Length: no more than 30 lines. An entry fee needs to be paid for each poem but you may not win more than one prize. Entry Fee: £8.00 for each poem. (Other currencies available: USD12.00, CAD16.00, EUR12.00, NZD18.00, AUD16.00.) If you wish to pay by HKD (HKD88.00), special arrangements apply. Please see below. Opening date for receipt of entries/fees 7 May 2017; Closing date: 14 July 2017. In 2017, judging will take place at the same time as the judging for the Proverse Prize for unpublished book-length fiction, non-fiction or poetry (please see the details for the Proverse Prize). Judges: anonymous (as for the Proverse Prize for an unpublished book-length work). The Proverse Poetry Prize is open to all who are at least eighteen years old whatever their residence, nationality or citizenship. THE FULL DETAILS AND THE FULL RULES, TERMS AND CONDITIONS WILL BE CONFIRMED IN DUE COURSE. To see these, please visit, from time to time, the website, proversepublishing.com. You may also send in a request to receive the free Proverse E-Newsletter. Дебатний день America House Kyiv: Штрафування користувачів за нелегальне завантаження контенту не є виходом для захисту інтелектуальних прав власності. Ви креативні, вмієте чітко та швидко формулювати свої думки, знаходите логічні звʼязки для відстоювання своєї точки зору, переконливі та володієте ораторським та мистецтвом презентації на високому рівні? Тоді вам до нас. America House Kyiv запрошує взяти участь у дебатах “Штрафування користувачів за нелегальне завантаження контенту не є вихом для захисту інтелектуальних прав власності”. Не прогавте можливість долучитися до палкої денної дискусії першої суботи листопада в Американському домі, що знаходиться за адресою вул. Миколи Пимоненка, 6. Формат події: парламентські дебати. Один з найрозповсюдженіших форматів, що грається по всьому світу та користується надзвичайною популярністю. До участі запрошуються дебатні команди. Професіонали чи початківці - не має значення. Головне - вміння твердо відстоювати свої інтереси. Кожна команда матиме власне завдання та цілі. Тема цьогорічних дебатів - захист інтелектуальних прав власності. Чи потрібні вони і якщо так, як саме має провадитися їх захист? Це користь чи шкода для сучасного суспільства? Інтелектуальне піратство - крута справа чи справа суду? Чи, можливо, все має перейти у відкритий доступ? Маєте свої ідеї з цього приводу? Ваша думка має значення. Приходьте та дізнайтеся, що інші мають сказати про захист інтелектуальних прав в Україні та світі. Тож ви зацікавилися та бажаєте долучитися до дискусії? Стати учасником можна досить просто - достатньо заповнити реєстраційну форму за наступним посиланням - https://goo.gl/TypJC4 та пройти конкурсний відбір. Кінцевий термін подачі заявок - пʼятниця, 21 жовтня. Відібрані команди отримають запрошення електронною поштою не пізніше 26 жовтня, а вже 5 листопада світ дізнається імʼя нового переможця дебатного дня в America House Kyiv. До зустрічі. 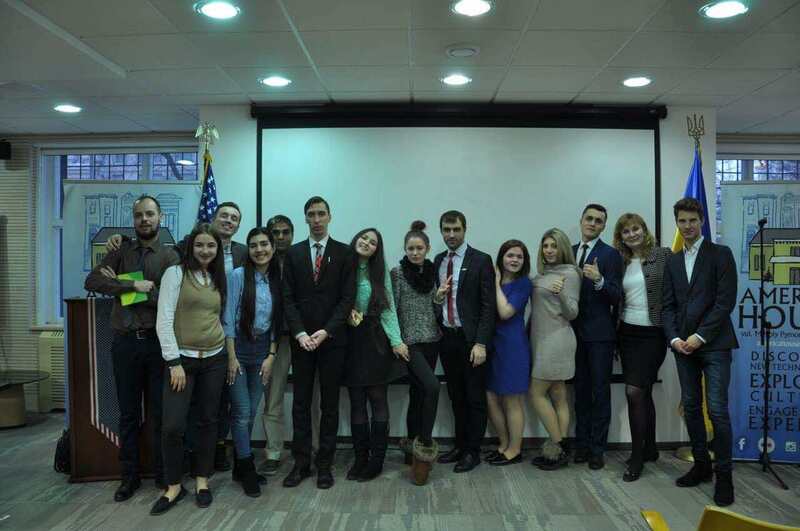 The Conveners of the English-Speaking Union Ukraine and America House in Ukraine have great pleasure in announcing the beginning of the National Public Speaking Competition 2016-2017. The competition will run from 1 October, 2016 until 28 January, 2017. The winner of the National Public Speaking Competition will represent Ukraine in the International Public Speaking Competition that will be held in May 2017 in London. The Deadline for application forms and video presentations is 30 November, 2016. The results will be announced on 20, December 2016 on the site http://www.esu-ua.org.uaand the semi-finalists will be invited to take part in the Final stage of the Competition, that will be held on 28 January, 2017 at America House, Kyiv. The theme is “Label jars, not people”. This year ESU International Council Meeting was held in Tbilisi, Georgia in early September, 2016. Delegates from about 20 international ESUs participated in the meeting. The ESU Ukraine was represented by the Chairman Margarita Danilko and a member of the Steering Committee Nadiya Ivanenko. A significant proportion of this year meeting was devoted to the ESU’s educational activities, including international competitions. The ESU competitions equip young people with the skills and confidence to engage in speech and debate in the English language, and give them opportunities for the exchange of ideas and wider cultural understanding as global citizens in the 21st century. During the meeting the delegates talked about the celebration of the ESU centenary in 2018. Jane Easton, Director-General of the English-Speaking Union, underlined, that the ESU’s founding vision for friendship, peace and understanding remains as strong as it was in 1918. However, the world has changed so much since the ESU’s foundation. English is now a global language and is taught as a foreign/second language all over the world. Global travel is commonplace. English is represented in the interconnected worlds of business, travel, modern technologies, science and academia, social media, sport and art. And yet, the tensions in the world because of the lack of cultural understanding and dialogue give the ESU members huge cause for concern. According to the Agenda delegates presented their Country Reports, which had been circulated electronically beforehand, and discussed some items raised by ESU member countries. The work of the ESU Ukraine was highly appreciated at the meeting. One more point to discuss was the location and frequency of International Council Meetings. One of the suggestions put forward was for the ICM to be held concurrently with the IPSC, in the years that the ICM is held in London. We are delighted to announce the results of the National Essay Writing Competition 2016. The judging panel decided not to award the 1 st prize.